Flowers are a beautiful and colorful way to decorate for important events, commemorate special occasions and accentuate your home or business décor. While real flower bouquets and centerpieces are beautiful, they’re usually quite expensive and don’t live for very long. Silk flowers provide the opportunity to create long-lasting floral arrangements without the added maintenance and wasted expense. While the term “silk flowers” once referred only to blooms comprised of silk materials, today it’s also used to refer to the many other types of artificial flowers, leaves and foliage on the market, made of materials such as velvet, polyester and latex. Silk flowers are available in garlands, individual flowers and other botanical pieces that can look incredibly lifelike. There’s no need to worry about soil conditions, sunlight or remembering to water regularly. They won’t wilt in warm weather or freeze in cold weather and don’t require any special storage (such as refrigeration) to keep them looking fresh. Silk blooms are non-allergenic and can even be scented to parallel the smell of real flowers. They require minimal maintenance to keep them looking beautiful, can be used again and again, and are easily changed to reflect the season or occasion. This guide to buying silk flowers will explore other advantages to purchasing silk flowers and explain more about what makes these items such a worthy investment. It will also explore things to consider when buying silk flowers as well as how to know if you’re buying high-quality silk flowers. 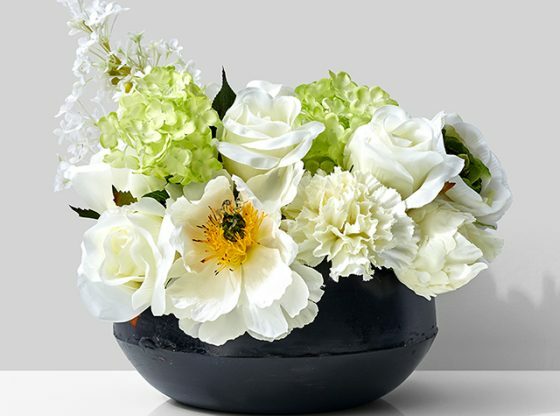 Once you have found the perfect artificial blooms, with practice and a skilled eye you can begin creating beautiful floral pieces that will last for many years to come. Using this handy silk flower buying guide will help you become an expert in no time! Silk vs. Real Flowers: Which One Wins Out? Silk flowers are often the more economical option when considering real vs. artificial since certain varieties of real flowers are costly and difficult to find in the off-season. Silk flowers are available throughout the year, with no special fees or seasonal restrictions. This is particularly convenient if you insist on having offseason flowers such as peonies at your January wedding or event or wish to incorporate chrysanthemums in the spring. When buying silk flowers, choosing those that are of better quality will result in more lifelike and aesthetically beautiful arrangements. High-quality silk flowers look more realistic and refined than their lower-quality counterparts. With so many different styles, types and colors of artificial flowers available today, knowing the features of high-quality blooms will help steer you toward the best ones. These realistic-looking single blooms are available in various flower types and lengths. They often have leaves and sometimes an additional bud. Their stem heights range from one foot to several feet high. Ideal for tall centerpieces or floor arrangements, flowering branches make a real statement. They can stand several feet high and pair beautifully with other silk flower varieties. A group of single-stemmed flowers grouped together constitutes a bundle, also called bunches or bouquets. Bundles usually feature stems cut to the same length and tied with a fancy ribbon or bow. Bundles can consist of blooms, leaves or a combination of both. They may contain the same or different colors and types of flowers. Bushes are leaf or flower stems joined by a single stem at the base. They can be placed as a single element in larger arrangements or cut apart and placed sporadically. They are typically a more economical option since you get more flowers. However, cutting through the thick main stem to separate flowers can be difficult. Silk flower sprays feature a single stem with clusters of leaves, blooms and buds. They can be placed in arrangements as they are, or the blooms can be separated and interspersed. They give arrangements a fuller look when placed uncut. These small but versatile silk flower elements offer versatility to arrangements. They can consist of small blooms or leaves and can be easily interchanged to reflect the season or occasion. Garlands are elegant strands of flowers, leaves or a combination of both. They come in a variety of lengths and flower types and look gorgeous when draped across tables and chairs or around columns or staircases. Your choice of silk flower types depends on how they will be used. Most flowers, such as roses, orchids, magnolias and hydrangeas, are available in various foliage forms from single stems to floral picks and garlands. Cherry blossoms branches and tropical leaf bushes make beautiful and bold statements. Silk flowers are also available in other forms, such as blocks, topiaries and flower balls. Silk flowers are a great option for weddings in particular, since they are lightweight, convenient and easy to transport and store. Real flowers can look brown and wilted by the end of the wedding, resulting in lots of money out the window. Since the average cost of wedding flowers makes up about 7-8% of the total wedding budget, it’s a great option to be able to keep your flowers after the wedding. They make sweet keepsakes for the married couple, guests and bridesmaids. Even if they cost a little more initially, the durability, lack of maintenance and convenience of high-quality silk flowers is worth it in the long run. While silk flowers can be found at most craft and home décor stores, along with many craft supply websites, the quality is not always the best. High-quality silk flowers feature details so lifelike you’ll have to feel them to tell they’re not the real thing. With that said, it’s helpful to know what the leaves, stems and blooms of the real plant or flower look like before embarking on your silk flower buying journey. This can help you to determine how realistic the details of the faux flowers are. Silk flowers of higher quality usually have wires throughout the stems, leaves and flower petals. This allows them to be arranged in a more lifelike way. Their stems are typically longer and are usually wrapped in realistically colored floral tape. They often feature a matte rather than shiny finish. They also will not contain any obviously fake details, such as water droplets or attached sprays of baby’s breath. Lower-quality silk flowers are typically dyed one uniform color without the addition of painting or details. They often contain visible seams that can make them stand out as obviously fake when viewed closely. They also usually feature shorter plastic stems and lack the fine wire throughout the stem and leaves, which allows for more natural shaping. There may be visible joints where the stems and flowers meet, and the edges of the blooms may be frayed. High-quality silk flowers can be found through floral supply companies that, in addition to carrying wide varieties of artificial flowers and foliage, sell the additional supplies and elements needed to create silk flower arrangements of all kinds. Artificial flowers offer color options that may not be found in nature, or that may be expensive or difficult to find if they are. They can be dyed most any color, including shades of gold, green, red and blue. Dyeing high-end silk flowers produces bright, vibrant blooms that make a statement in any arrangement. If properly cared for, high-quality silk flowers should maintain their color for many years. Silk blooms in colors that resemble the flowers’ natural color look the most realistic. In nature, individual blooms are not solely one color. When choosing artificial flowers, the higher-quality ones are usually hand painted. Hand painting allows for subtle shading and color differences that are present in real flowers. Hand-painted silk flowers contain intricate little details that make them each look different, just as they are in nature. Choosing a realistic and aesthetically pleasing color palette for your silk flowers takes careful planning. While it’s perfectly OK to use blue roses to make a statement at a themed event, if used as a home décor accent, they will be immediately spotted as artificial. Your color scheme should contain no more than 2-3 colors that look nice together. Choosing more than this can make your arrangement look disorganized and chaotic. A simple color palette looks elegant and natural. Having a well-planned color scheme also provides direction for planning your arrangement, which is helpful for beginners. Popular color schemes include complementary, analogous or monochromatic, where one color is used throughout. Once you have the basic flowers chosen according to the color scheme, you can fill in with different floral elements that will add pleasing detail and fullness. The container you choose for your arrangement should reflect the occasion and any desired theme or color scheme. Some popular ideas include metallic urns, colored glass vases and wooden bowls. For the silk flowers to stay in place, you need a special floral foam. This type of foam allows the flowers to easily poke through without shredding. It can be cut and shaped to the size of the container or vase. To secure the Styrofoam in the vase or container, you can use special tacky clay or double-sided tape. Use hot glue or other permanent adhesives for a more long-lasting arrangement. To cover the Styrofoam and make the arrangement appear more lifelike and full, moss is commonly used. Moss is available in many varieties, including dried or Spanish Moss, both of which are popular choices for floral purposes. This flexible tape is made of paper that sticks to itself when stretched. It is ideal for joining stems and piecing together floral elements. It is typically available in shades of green and brown. Sharp cutting pliers are needed to trim the thick stems of artificial flowers. Other floral tools such as a sharp knife for shaping Styrofoam and scissors for cutting through tape are also helpful supplies to keep on hand. Beautiful silk flowers pair nicely with additional artificial elements, such as feathers, berries, birds or butterflies, which can also be purchased through a top-quality floral supplier. The Hair Dryer Method: Use the lowest heat and air setting on your hair dryer to blow the dust off the leaves and blooms gently. The Shake Method: Place your silk flowers in a paper or plastic bag with a sprinkling of salt, rice or cornmeal, and gently shake them around. Shake off the materials, and your flowers will look noticeably cleaner. The Wipe-Down Method: Dampen a soft cloth with water or a mixture of water and white vinegar and individually wipe down each leaf and flower. Allow them to air dry. Always test your silk flowers for colorfastness beforehand, and avoid getting excess water on any areas with adhesive. While high-quality silk flowers are made to stay vibrant for many years, protecting them from excessive direct sunlight is a way to ensure this. Silk flowers can be coated with a clear UV resistant spray to help prevent them from fading. Jamali Garden is your one-stop supplier of everything you need to create beautiful silk flower arrangements. Consider us for your next wedding, home décor project or corporate event. We carry a wide variety of high-quality silk flowers, including single stems, garlands, sprays, picks and branches. We also carry the supplies you need to pull it all together, such as floral foam, lifelike mosses and a vast selection of vases, urns and other containers. View our extensive selection of silk flowers to start planning your next silk flower project. Browse around the site today – at Jamali Garden, we are proud to offer quality products that inspire great events! Cuts easily without crumbling or shedding. All-natural moss - an ideal filler for vases and arrangements. Durable pliers perfect for all of your floral cutting needs. Create a beautiful rose centerpiece or accent with this realistic stem.